Custom Home Address Plaque with 5.5" Numbers Metallic Colors - - features a dimensional two-tone border and tall 5.5" numbers for enhanced visibility from the street. Made in USA. One-line house number sign available for lawn or wall mount. Holds five large 5.5" black numbers. Unique shape combines rectangular elements with a slightly arched top shown in brass & bronze) at the top of this page. Dimensions: 20.5"W x 12"H x 1.25"D.
Two color combinations: brass & bronze with black numbers (see large image above) and silver & pewter with black numbers. 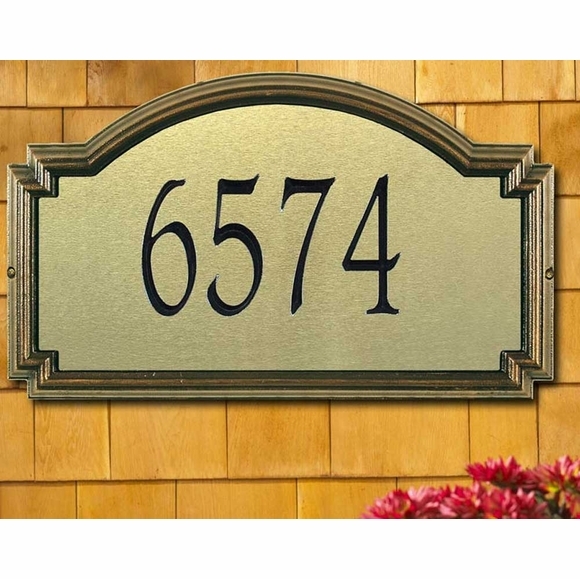 House number sign with 5.5" numbers and distinctive dimensional construction.